I bought my first vehicle that was younger than 10 years old (came in as close as I could without going over, right at 9 years). A month later, it was hit repeatedly by a tow truck in a parking lot. Nearly 9 months later, a hit and run encounter outside of my house affirmed me that I’ll never own a nice vehicle while living in the city. I sold my house after a long year of big decisions, risks, and flipping. It taught me how to lay tile, design a kitchen, and put in the long hours in hopes of a big return. I started waking up a few hours earlier to become more productive before sunrise. I’m yet to master the earlier bedtime. Preparing for this next list has felt much different. At first I thought that maybe I was in denial that the next number is 30. As I was entering into my 20’s, the age of 30 was a monumental moment as I had a lot of goals aligned to it. No need for the gritty details, just know I was the typical privileged white kid that expected to have a family, high-salary job, and house with the fence. Instead, I find myself at 29, single, renting with a roommate, and still figuring out a lot about myself. But to say I’ve come to terms with my current situation is an understatement. I’m learning how to love myself and to do it well. I’m learning how to live in a way where planning and strategizing every single move isn’t a requirement. And to be honest, it’s a lot more difficult than I ever imagined. My lifestyle according to social media tends to appear a bit more radical than reality; that’s because I’ve developed a career in content and storytelling. And while I’ll never fear a last-minute planned trip out of town, just know that my mind is always moving at a million miles an hour and I’m always considering the next move before we get there. The week leading up to my birthday I found myself sleeping very little and working more than ever, in preparation for a snowboarding weekend in Colorado. I told myself that I’d write it on the plane ride out. Instead, I responded to emails and caught up on Twitter. Classic. But after the first night in Winter Park, I oddly felt no desire to open my laptop, which is extremely rare for me regardless of location. It wasn’t until the morning of my birthday two days later that I even began to think about this list. 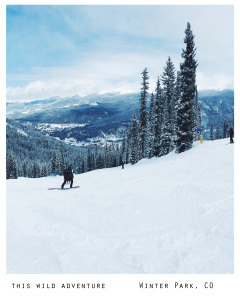 I sat on the fresh powder at the top of the mountains at Winter Park, over 12,000 feet above sea level. I looked out at the Rocky Mountains, my view allowing me to see for miles and miles. These are the environments that lead to my most spiritual moments; which is why I hike, camp, travel, and explore. In these moments, there is plenty of distraction available, yet a clarity of mind mixed with absolute awe. As I sat, a very simple yet significant phrase entered my mind. And in that moment I knew that this would be the guiding light for the list. Try a new cultural dish. Get another MLB stadium in. Turn the phone off for an entire day. If the hair recedes even more, it’s time to shave the head. Do something vastly different for your 30th birthday.